Highly experienced homicide police officer, Lieutenant Peter Decker of the LAPD, knows a 3am call means something serious. 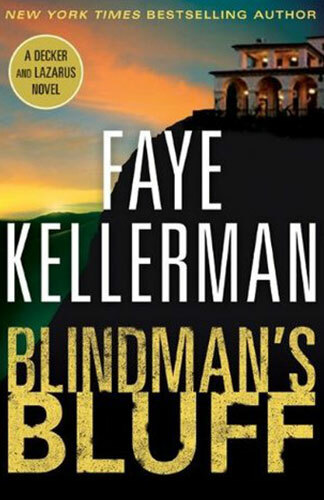 Blindman’s Bluff begins with a multiple homicide: three members of the wealthy Kaffey family, two bodyguards, and a maid; two additional security officers are missing. Earlier, Decker’s wife, Rina Lazarus, had been selected as juror in another Los Angeles criminal case and just days into the trial, a curious incident at the courthouse connects her to Decker’s investigation. This classic police procedural contains, as usual, interesting issues and characters including all of Decker’s team and lots of appealing food. A variety of personal conflicts between Peter and Rina, with just enough mentions of Orthodox Jewish homelife, adds an interesting layer. In this 18th novel in the series, Faye Kellerman has created an enjoyable plot with several story lines that connect in a satisfying ending.